I run a evening pottery classes in blocks of 6 weeks, currently on Monday and Tuesday evenings in Ledbury. Throwing and hand-building in porcelain clay. Suitable for complete beginners as well as returning students. Small group size of 4 students to ensure sufficient one to one tuition. The focus of the course is on developing wheel-thrown skills and hand-building techniques in equal measures, working with a very high quality porcelain, Valentine Royale. I also share techniques that I have developed within my own work, such as altering pots on wheel and constructing pots from slabs of clay. The course will also cover other principle pottery skills such as clay preparation, turning, handling, finishing and glazing. £150 (Deposit of £50 to reserve a place, the remaining £100 to be paid by 1 week prior to course start date. Tea, coffee and cake included! As well as my regular evening classes I also offer one-off sessions. Typically two hours long, this offers the perfect opportunity to try out a chosen activity; you may choose to have a go on the wheel and throw a bowl or cup, or try out hand-building techniques such as tile making and decorating, folded pots or jewellery making. As well as making, I can also offer sessions on decoration techniques. A taster workshop also makes for a great present. Gift vouchers are available! £50 for two people for a 2 hours session. Tea, coffee and cake included! Know of someone young who would love to get their hands in clay and make their first pot? I offer workshops for children and families, schools and groups. These are always tailor made to cater for individual needs. Please contact me if this is of interest. 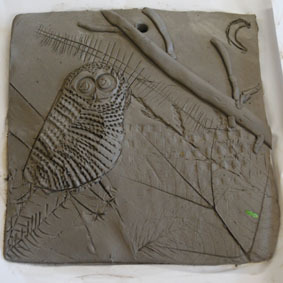 Over the past 6 years I have run a variety of clay based workshops for children aged 2-16. On Saturdays I run pottery hobby workshops for the students of The Downs, Malvern. I have also run workshop for groups such as Swansea Young Single Homeless project, Hereford Council and The National Waterfront Museum, Swansea. See images of children's workshops and community projects. To register your interest or inquire about a workshop, please fill out the form on this page and I will be in touch.